Both the Canadian Wind Energy Association and Ontario Energy Minister Chris Bentley expressed disappointment with the OFA’s position, saying that a current provincial review of the feed-in-tariff program is already addressing many of the OFA’s concerns. This may well be true of the economic issues, but the deeper question of community impacts is what appears to be at the heart of the OFA’s position, and that’s a question that may not be so easily addressed. Driven by the rising public clamor about health effects reported by people living near wind farms, officials across the nation and around the world have been called on to assess the veracity of these claims. This week’s contribution to the rapidly expanding genre of “wind farms and health” literature comes from the Massachusetts Departments of Health and of Environmental Protection. 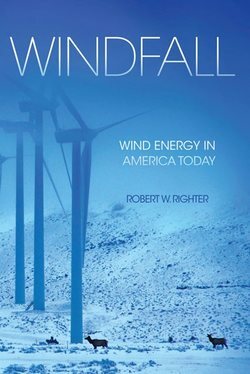 In contrast to last week’s more comprehensive report from Oregon, the Massachusetts report follows in the pattern of the first two similar literature reviews (one funded by the American and Canadian Wind Energy Associations, and another from the Ontario Ministry of the Environment), in that it focuses solely on direct impacts and previously published research papers. It also addresses a few of the more recent studies, including those by Pierpont, Nissenbaum, and Rand and Ambrose, generally offering them some affirmations for providing new information worth building on, but finding their results not yet solid enough to base siting policy on. Except for the sections on these recent papers, there is no place in this report for consideration of actual experiences of people living near wind turbines, despite the presence of a neighborhood full of folks in Falmouth who were no doubt ready and willing to share their stories. From what I’ve heard from these folks, they would offer cogent, detailed, and level-headed testimony about their experiences. While I can understand why an expert panel might choose to focus only on published material (to avoid the quagmire of trying to assess the veracity of individuals’ reports), and I give the Massachusetts panel due credit for not artificially limiting itself to papers published in peer-reviewed journals, they dropped a crucial ball in neglecting to even mention the word “indirect” in the course of their 164 page report on health effects, let alone provide any sort of acknowledgement or analysis of the ways that annoyance, anxiety, sleep disruption, and stress could be intermediary pathways that help us to understand some of the reports coming from Massachusetts residents who say their health has been affected by nearby turbines. The US Navy isn’t quite so pleased, however. According to a recent BBC article, US Navy oceanographers have arranged to filter data from one of the largest ocean observatories, NEPTUNE, off the coast of British Columbia. Citing concerns that the recordings will disclose areas of Navy operations, real-time recordings are cleansed of Navy ship (and presumably sonar) sounds, then returned to NEPTUNE operators for uploading to the web. Cornell University’s Chris Clark doubts that the Navy’s approach will catch on at other observatories around the world. 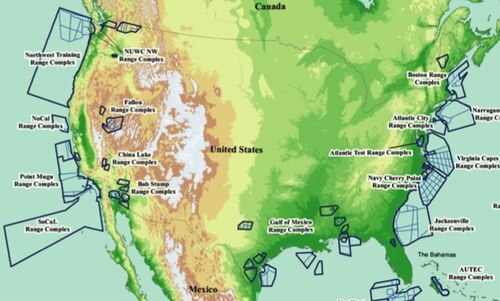 According to a piece on The World, from PRI and the BBC, (sounds above from there; roll over tiny screens to ID the sounds), Clark says the US Navy doesn’t own the ocean acoustic environment and has to accept that what was once military technology is now in the hands of civilians. “The cat’s out of the bag, the horses are out of the barn, whatever the metaphor is, it’s happening,” he says. The piece notes that this is similar to what happened with satellite imagery. For decades, it too was sensitive military data, but now anyone can go on Google Earth and look down from space. Fish survey sounds reduce humpback songs 120 miles away? An ongoing research project that monitors whale calls and shipping noise in Stellwagen Bank east of Boston Harbor has reported an unexpected reduction in humpback whale songs during an 11-day period in which their recorders picked up low frequency sounds from a fish-monitoring system 120 miles away. If this data does indeed represent whales ceasing singing or moving away in response to the distant sonar, this would be the first clear-cut indication that discrete human noise events may affect marine mammal behavior outside the immediate area. The authors note that these results could suggest that impact assessments need to consider effects at longer ranges, and that effects may occur at received sound levels much lower than those generally considered worthy of concern. This study simply reports the reduction in singing; any longer-term effect that may have on the animals is unknown (these are not mating calls). 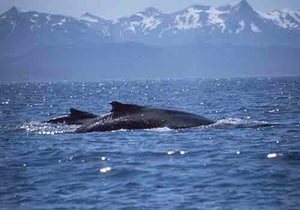 The reduction in songs occurred at a time of year (early fall) when humpback songs are beginning to increase in this area; on years when the fish sonar was not in operation, the numbers of songs steadily increased over the 33-day study period. But in 2006, when the fish sonar was heard at Stellwagen Bank for 11 days (8 of which included sonar sounds for over 7 hours), the number of minutes per day when humpbacks were singing dropped, some days to zero. 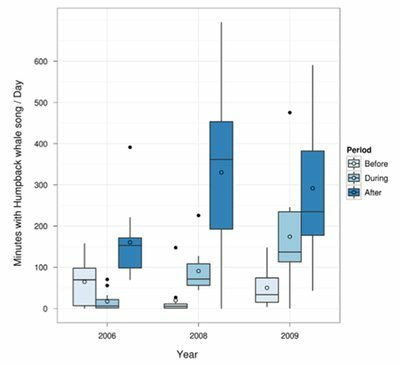 The average (mean) number of hours of whale song dropped from about 75 in the previous 11 days to about 15 minutes during the time the fish sonar was heard, before increasing to close to 3 hours per day once the sonar transmissions ceased. The figure below shows the data from each of three years. For each year, there are 33 days of data, with the middle 11 days being the period (Sept. 26-Oct 6) in which the sonar sound occurred in 2006. The open circles are the mean minutes/day for each 11-day period, with the rectangular boxes representing the upper and lower quartiles of data for each period; black dots represent one or two days in each period in which the calling rates for that day were unusually far outside the range for other days in that period. 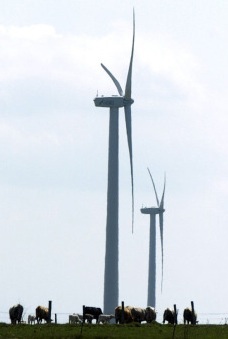 Wisconsin towns say: wind farms not so bad, but no more! Indeed, the article, while headlined and framed to suggest that initial fears have been unrealized, mentions that one landowner “and a few others” continued to object about wind farm impacts for years afterward, though offers only one quote from this perspective, a former Town Board member who hasn’t changed his view since voting against the plan. One local, dairy farmer Joe Yunk, who moved away from the area after struggling with the noise only to find his new land targeted for a wind development, submitted a formal comment to the Wisconsin PSC in July 2010, in which he notes that Wisconsin Public Service, the developer of one of the two early wind farms, bought out two neighbors within a year (after noise issues cropped up) and demolished the homes, while several of his neighbors received below-market buy-out offers. After suing the company to purchase his property (two turbines within a half mile, the closest 1300 feet from his home), they settled with him for slightly under the market value, and his home was put on the market by the developer for 30% below its appraised value. It appears that in this region of Wisconsin, the community impacts and attitudes pretty much reflect what we’ve seen elsewhere: in the community as a whole, the wind farm is generally accepted (though not exactly celebrated) and overall property values show no dramatic decline, while for a subset of the community the wind farm continues to be seen as an unwelcome presence, and some of the nearest neighbors find their lives severely disrupted. Once again, it appears that larger setbacks, to prevent these life-changing impacts on the few, combined with easements to allow closer siting to willing neighbors, could have avoided the enduring “bitterness” that Nowak mentions at the article’s conclusion. NOAA Fisheries has released its latest annual estimate of the beluga population in Alaska’s Cook Inlet, and the numbers are sobering. Their 2011 estimate, 286 animals, is the second-lowest found in the 18 years of surveys, and is 20% lower than last year’s count. However, NOAA officials stress that year-to-year counts are approximate, with differences in observing conditions and beluga distributions accounting for an error range of plus or minus as many as a hundred animals; long-range trends are more reliable indicators. Officials say they did not see a large enough number of dead whales this year to suggest that there was indeed a 20% decline. “Only three dead belugas were reported this year, which indicates that large numbers of mortalities did not occur in 2011,” said Alaska Fisheries Science Center Director Doug DeMaster (over the past ten years, an average of 10 whales a year have been found dead). “While NOAA remains concerned that this population is not showing signs of recovery, at this time we do not believe this estimate represents a marked decrease in the population.” Indeed, twice before, the counts showed even larger declines, with later years suggesting that actual numbers were not so dire; the previous low count, 278, occurred one year after a count of 366, and two years later, counts were back up to 375. However, since then, counts have been at least 10% lower than that high. This is especially worrisome, in that this genetically-distinct population of belugas has been listed as endangered, and NOAA designated much of Cook Inlet as critical habitat. (Many other beluga populations remain in other areas, including the western and northern coasts of Alaska, and northern and northeast Canada). On the longer term, NOAA notes that there appears to be a continuing gradual decline in Cook Inlet beluga numbers, estimated at about 1% per year. This population of belugas experienced a population crash in the 1980’s (from 1300 down to around 300) which is widely blamed on over-harvesting by native subsistence hunters, but has not recovered since the hunting was limited. Pollution, limited salmon runs, and noise are all considered likely factors in the population’s struggle to survive. Cook Inlet is a large waterway, leading from the southern Alaska coast inland to Anchorage and Wasilla; a major port expansion is underway, as well as oil and gas exploration and development. For more on the backstory here, see these previous AEInews post from 2008-2011.